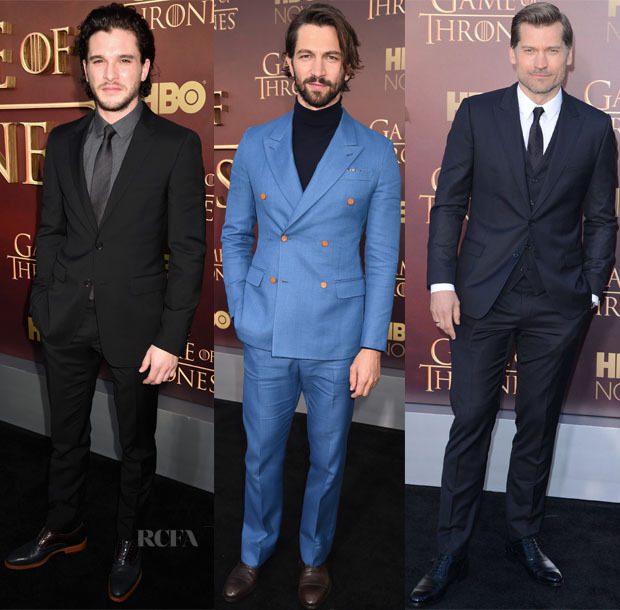 The premiere of HBO’s ‘Game of Thrones’ Season 5 would have not been complete without the trio of men who were also in the mix at the San Francisco War Memorial Opera House on Monday (March 23) in San Francisco, California. Kit Harington: The British actor was dapper in shades of charcoal grey with his button-down shirt and tie worn with a dark suit. The slick pair of oxfords with a wood-grain sole really brought this simple yet polished look together. Michiel Huisman: Scruffily handsome, Michiel was quite the Dutch treat in his cornflower-blue Louis Vuitton double-breasted sport coat and pants. The dark navy turtleneck sweater threw me off at first, but he wears it so well, I can’t complain. Nikolaj Coster-Waldau: The Danish actor’s steely stare was complemented by the navy three-piece suit and crisp white button-down shirt. What caught my eye was the detail of the tailored jacket and vest with the accent seaming that added a subtle yet effective touch.